The ever expanding world of object printing has just added another dimension. Researchers at the University of Wollongong are building 3D printers that can create objects that change over time - a technique they're calling '4D printing'. In a normal 3D printer, structures are built up layer by layer into a pre-programmed shape. Normally plastic is used, but other substances can also be printed too - like sugar, or cellular material. 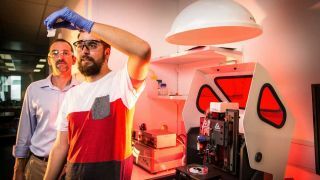 The Australian team chose tough hydrogels that change their properties when exposed to heat and moisture, and used them to 3D-print a smart valve that can control water flow. Cold water flows through normally, but it closes when hot water is detected. The immediate application for the work will be in the field of soft robotics, but it's thought that similar techniques could be used in medicine, construction, and automation. "The cool thing about it is that it's a working, functioning device that you just pick up from the printer," said one of the researchers - Marc in het Panhuis. "There's no other assembly required. It's an autonomous valve, there's no input necessary other than water." Their research was published in Macromolecular Rapid Communications.